The number of qualifying stock dropped to 34. However, there was little change at the top. Top dog is everyone's favourite, Apple (AAPL). Yesterday's earnings will put a dampner on today's trading, but the stock is likely to continue inside a newly formed rising channel and above $350 is additional support (not to mention the 200-day MA). Given the tumultuous past few weeks for Apple it's going to be interesting how the stock reacts going forward. A lengthy sideways consolidation - holding above $350 - would probably offer the best tonic. But for now, the stock is honoring a rising channel and trades are best held until this breaks. Second on the list is Vale S.A. (VALE). The 'Bear Flag' from September continues to influence as the attempted rally in early October stalled at converged resistance from the 'Bear Flag' low at $25, plus additional supply generated by the 50-day MA. The stock remains on course to reach the measured move target of $20.14. Bulls are unlikely to bite until it breaks above $25. Rio Tinto (RIO) is in the same predictament as Vale S.A.. It too stumbled at resistance created by the August swing low, converged with its 50-day MA. The bullish threshold to break is $55. In fourth spot is Cnooc (CEO). The stock is stuck in a downtrade created from the April 2011 high. Like other stocks listed here it's contained by resistance created by the August swing low and the 50-day MA. The line in the sand for bulls is $180. In fifth place is Barrick Gold (ABX). The Accumulation Swing Index is suggesting the $42-$55 trading range, which has been in play throughout 2011, is likely to break to the downside. For now, it remains inside the range with resistance at the 200-day MA. Shorts might become more emboldened at this level, placing stops above the 200-day MA. Next is Baidu (BIDU). Last month it cracked below the rising channel from 2011 with only $115 left to cling on to for support. Since the break, it ducked below $115 before recovering, only to encounter supply where once there was support. There is significant resistance around $130 with October buying volume out gunned by selling volume. In seventh spot is Free McMoran (FCX). The stock bust through $47 support and has evolved into a new downward channel. Even if the channel was to break upside it wouldn't be long before it's against newly formed $47 resistance. 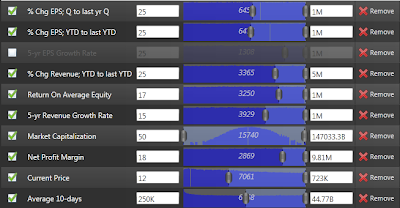 On the bullish front, buying volume has surpassed selling volume for October - this favours an upside break. The last spot on the list goes to Priceline (PCLN). Last month the stock narrowed towards a triangle apex, eventually losing trendline support, but finding support at $450. From this, a new downward channel has emerged. Within this channel there is resistance at the 200-day MA which is where PCLN finished yesterday. Shorts will look to play this with stops above yesterday's high at $506. 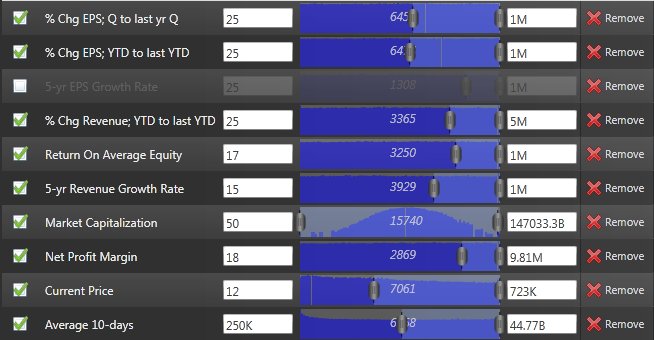 If you are interersted in creating your own active stock screen you can do so here. You can watch a video on creating an active stock screen here.